Fridays are great for learning and catching up with industry news right before you go off to enjoy an amazing weekend, am I right? A great perspective on purpose-led companies and their subsequent business success. Not only does purpose adds years to your life and makes you more resilient, it also translates into committed employees and improves your bottom-line in business. Research from Deloitte shows that 90% of people who believe their organization has a strong sense of purpose also report a strong financial showing in the business. Efficient leadership is crucial to employee engagement. As Gallup points out in one of their reports, managers account for 70 percent of variance in engagement across business units. However, it’s not an easy task to find the right managers, as shown by Workplace Trends’ 2015 report, where almost half of the 1,000 HR professionals surveyed named leadership as the hardest skill to find, and only 36 percent listed leadership as a strength in their own organizations. The human brain works the same regardless of your job position. Even if you’re an accomplished CEO with years and years of experience, your brain is not immune to anxiety. If you;re not familiar with neuroscience and the essential role it plays in business, take a look at our recent Neuroscience for Business Series. According to Harvard Business Review, psychology research has shown that anxiety influences decision making—for example, job anxiety can cause people to fixate on potential threats, thus missing big opportunities. How do you think this influences a CEO’s strategic decision making? Staying on the brain topic, let’s talk about fear of failure and the need to be perfect. 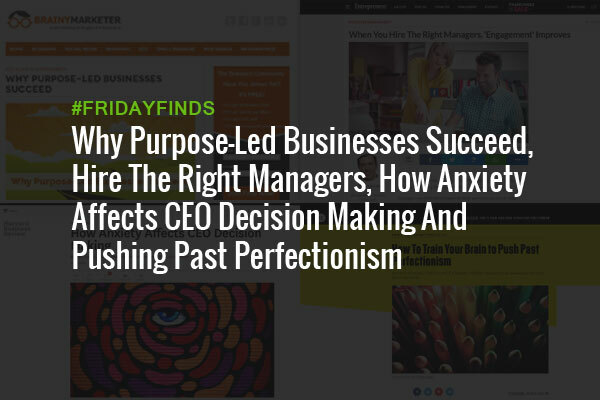 How many of us suffer from perfectionism to the point that we’re no longer admirably pushing ourselves to excellence, but harming ourselves professionally and psychologically with the need to always be perfect? When you’re so overwhelmed by work and anxiety, you can’t get anything done, and you become trapped in a loop of unhealthy thoughts, impulses, and behaviors. Join us next week as we share more of our favorite articles. We’d also love to know what articles made your week and what topics you’d like us to talk about next week so comment away.